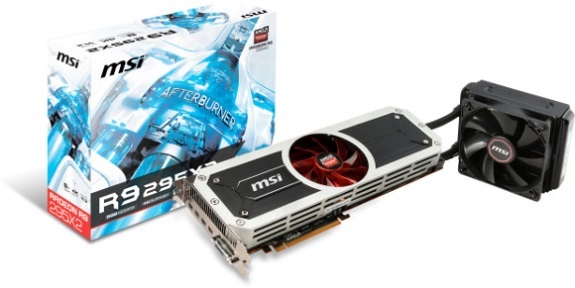 MSI, the gaming force in Graphics Cards is happy to announce the availability of the new AMD Radeon R9 295X2 Graphics Card. With two R9 290X GPUs on-board with clock speeds up to 1018 MHz and 8 Gigabyte of GDDR5, the R9 295X2 delivers the most insane frame rates in todays and future games. The card is cooled with a zeo maintenance liquid cooling system so gamers can expect cool temperatures, quiet operation and consistent performance. So whether you’re looking at the best card for Gaming at 4K and higher resolutions or want to be in the driver’s seat for this year’s most stunning PC Games, the R9 295X2 is the right choice. The record-shattering dual-GPU R9 295X2 is packed with two Hawaii XT GPUs featuring 5632 processors running at speeds up to 1018 MHz. The massive 8 Gigabyte of GDDR5 runs at 5 GHz and delivers enough bandwidth to drive 4K screens or 5 1080p screens in Eyefinity. Together with support for TrueAudio and Mantle technology, the R9 295X2 is ready to power the best games of 2014. Hidden under the massive aluminium housing, the MSI R9 295X2 contains a unique liquid cooling solution from Asetek that keeps the GPUs running at full speed. Heat dissipation is performed through an external 12cm fan with radiator that dissipate the heat from the dual GPU pumps. A separate fan in the middle of the card cools the rest of the on-board components making this a unique water cooling set-up for reference cards.